Fellowship House is in a 1970s building and is the smaller hall, with one large room which can be divided into two rooms. There is a lobby, kitchen and toilet facilities. 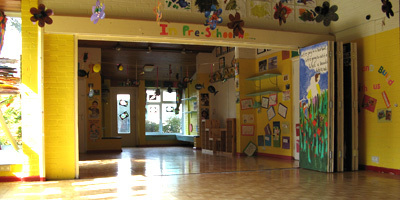 During the week the hall accommodates the Oak Tree Day Nursery. Fellowship House measures approximately 46ft x 14 ft, and can hold approximately 80-100 people standing. The hall has 6 tables each measuring 6ft x 2ft. 6ins and 40 - 50 chairs. Although most hirers find our tables suitable for children, should you wish to hire smaller tables and chairs, they must be delivered and collected within the period of your hire. The kitchen in Fellowship House has a cooker, kettle and a fridge. There is no crockery or cutlery other than a few mugs. We are afraid that it is not possible to borrow play equipment belonging to the church or Day Nursery. The Day Nursery play area and its equipment outside Fellowship House kitchen is out of bounds. We regret that we do not allow any teenage parties or wedding receptions in Fellowship House. For details of how to book Fellowship House at the weekends, please see the planning your event and booking information pages.